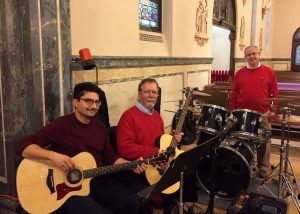 Come and listen to the “joyful noise” being made by St. Joe’s Music Ministry! We are happy in our service to our community and our God, and countless times over by our fellowship with one another. Our Adult Choir is comprised of a very dedicated group of people. Some are professional, others are volunteers who don’t even read music. All are welcome. Come join us! 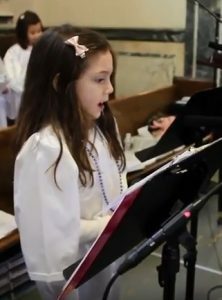 Our Children’s Choir sings every 3rd Sunday of the month, as well as holidays and other feasts. The Music Ministry at St. Joe’s has released two CDs as fundraisers for the restoration of our pipe organ, “God Bless Us Everyone” (Christmas 2016) and our new “Easter Song” (2018). Come find us not only on Facebook but also on Amazon, iTunes and CDBaby! We use both Gather 3rd Edition and Breaking Bread hymnals, providing a wide choice of music and mass settings familiar to both older parishioners and the younger generation. We are grateful to have excellent cantors to lead worship in song. 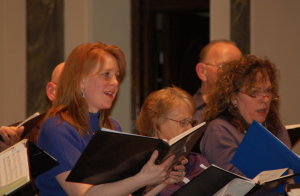 We welcome anyone interested in joining the choir or cantors to give it a try at least once or twice. Youth who are skilled at an instrument (intermediate level and up) may also inquire about playing. 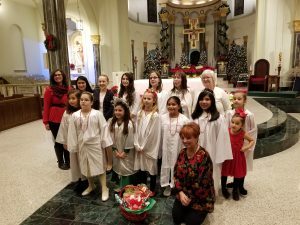 If you are interested in being a part of this very rewarding and vital church ministry, please see our Music Director Diana Belkowski after any Mass.